When it comes to the rural lifestyle, hobby farmers, landscapers, and homeowners, the New Holland Boomer Compact Tractor 24 HP is the ultimate power tool. Constructed to make all of your jobs easier, they are productive, receptive, and comfortable. They’re very versatile, and with a collection of diverse implements and attachments, they can handle just about anything on your to-do list. The engine is tier IV, 3 cylinder, which will give you the power you need to handle a variety of jobs and tasks. It runs clean and quiet, automatically. There is no need for additional hardware or fluid. This engine will continue to run clean with no further input at all from the operator. The hood-mounted fuel tank hold 6.6 gallons, making it one of the largest fuel tanks available, saving you time with fewer fill ups while performing tasks. You do not have to worry about the Boomer 24 when it comes to starting in colder weather, because it comes equipped with a quick-heating glow plug package. It also features a heavy-duty 560 CCA battery that supplies an abundance of cranking power. A 50 amp alternator provides superior battery charging and the strength to handle additional power needed for electrical accessories. The Boomer 24 features a high-performance, two-range dual-pedal hydrostatic transmission that removes the need for gears and clutching. The two foot pedals, forward and reverse, control the direction and speed the tractor moves, making maneuvering much easier. 4WD comes standard on this machine, which is helpful in getting jobs done more efficiently. With a lever that switches between 2WD and 4WD, it is incredibly easy to alternate between gears when you need extra traction. It also features cruise control, beneficial when working on large areas. 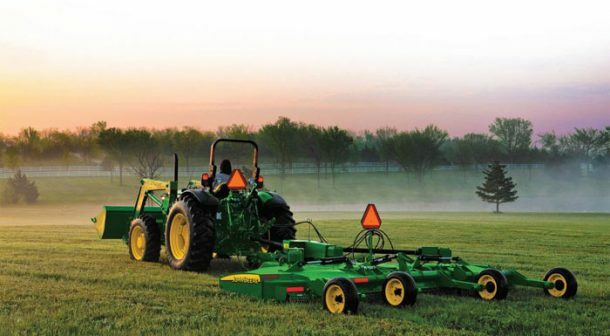 You won’t have to continually press the pedal and you can set the tractor at the speed you want to operate. The left hand fender control gives you the option between low range and high range, depending on the task you are performing. This compact tractor hydraulic system holds enough power to keep up with numerous job demands. The rear three-point hitch also possesses a high amount of power and provides a lift capacity of 1,433 lbs in order to lift and operate heavy implements and attachments to help complete more tasks. The power steering is very responsive and ensured by a 2.9 gpm dedicated steering pump. To power attachments, there is a separate 6.7 implement pump which makes a total hydraulic flow of 9.5 gpm. Having separate systems is beneficial for the machine because then one cannot tax out the other when extra power is needed. It has two power take-off options, a mid, independent PTO (2,000 rpm), and an independent, rear PTO (540 rpm). They are both electro-hydraulically engaged, which makes starting and stopping the tractor virtually effortless. 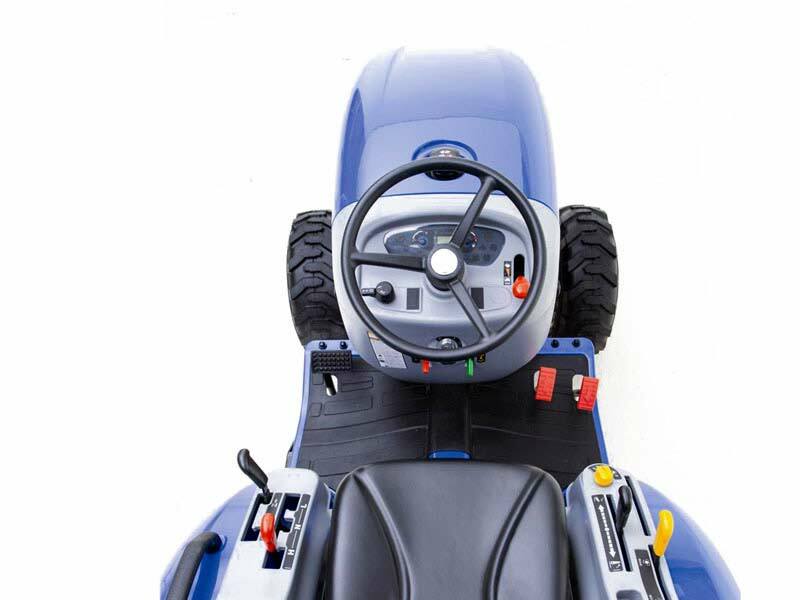 The operator platform was designed to be the most comfortable seat on the market. A contoured seat with a high, flip up back that glides on a track will adjust to get you into the right position for optimal visibility and comfort. The roll over protection system (ROPS) will keep you as safe as possible in the event of the tractor tipping over. Note: Even with state-of-the-art ROPS, it’s still very important to always fasten your seatbelt when operating your tractor. All of the controls located in the operator platform are color coded and labeled with their designated functions, making them easy to read and use. Maintenance is easy on the Boomer 24 because all of the maintenance points are conveniently located on the right side of the engine and you can check the engine oil level without raising the hood. 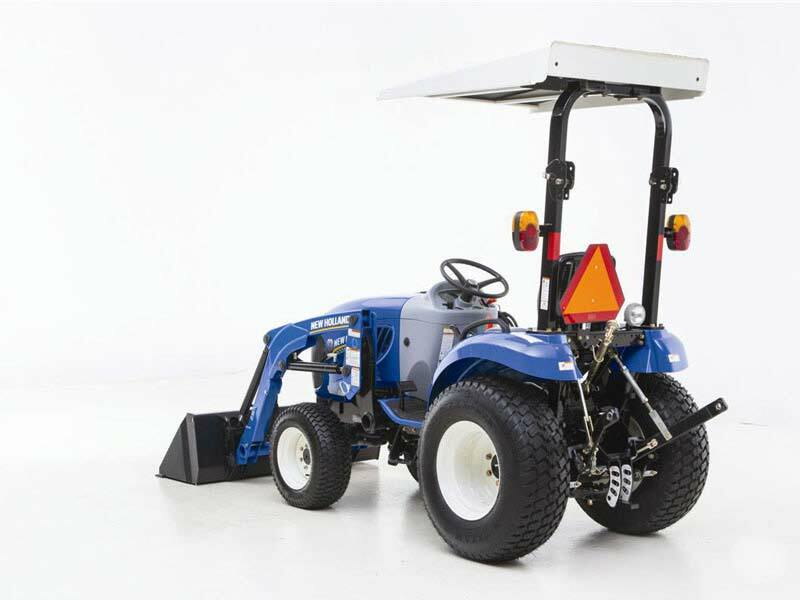 The high-pivot hood lifts on a mechanical rod, giving you total access to the engine, battery, and radiator, making it simple for inspection and routine maintenance to the tractor. With numerous attachment options, including loaders, box blades, backhoes, mowers, and more, the Boomer 24 is a very versatile machine to own. 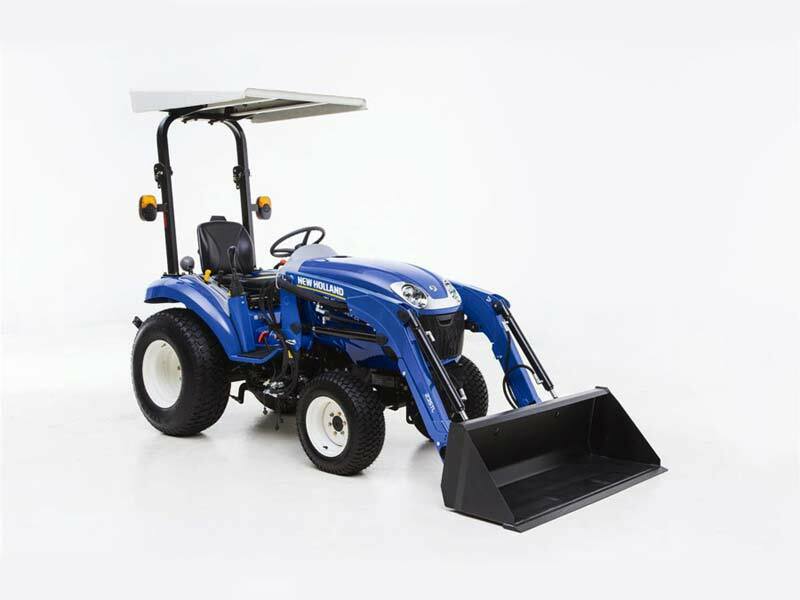 Featuring smooth speeds, top notch maneuverability and traction, excellent power, easy operation, and simple service, it is a tractor that can get a variety of tasks done effectively and efficiently.